In this article, we will take a look at Spot Anthracnose. Spot anthracnose, or Anthracnose, is a disease caused by a fungus that infects some rose bushes. Not much is known about spot anthracnose except that it seems to be most severe during the cool moist conditions of spring. Typically wild roses, climbing roses and rambler roses are the most susceptible to this disease; however, some hybrid tea roses and shrub roses will also contract the disease. The fungus that causes the problems is known as Sphaceloma rosarum. 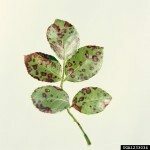 Initially, spot anthracnose starts out as small reddish purple spots on the rose leaves, which makes it easy to confuse with black spot fungus. The centers of the spots will eventually turn a grayish or white color with a red margin ring around them. The center tissue can crack or drop out, which can be confused with insect damage if the infection is not noticed until the later stages. Keeping rose bushes well spaced and pruned so as to allow good air flow around and through the rose bushes will go a long way in preventing the start of this fungal disease. Removing old leaves that have fallen to the ground around rose bushes will also help in keeping the spot anthracnose fungus from getting started. Canes that show severe spots upon them should be pruned out and discarded. Left untreated, spot anthracnose will have the same effect as a major outbreak of black spot fungus, causing severe defoliation of the rose bush or rose bushes infected. Fungicides listed to control black spot fungus will typically work against this fungus and should be applied at the same rates for control that are given on the label of the fungicide product of choice.